WheelerTM Delta AR-15 Rig Tool. BIG BUCKS OFF! The right Tool for the job! Lets you compress the delta ring on your mil.-spec AR-15 or M16 with one hand, making handguard removal a cake walk. 100% vinyl coating protects your gun's finish from damage. Welded steel bracket for strength against stuck or broken delta ringsgo ahead and crank away! Wheeler Delta AR-15 Rig Tool is rated 4.6 out of 5 by 26. Rated 5 out of 5 by PAJohn from Well made Good price, well made, works as designed. 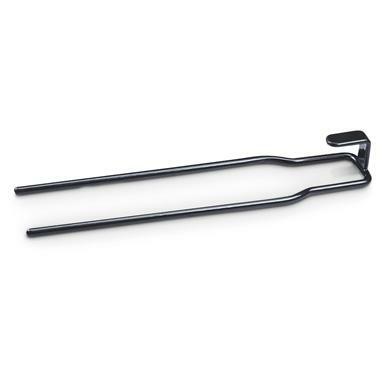 Rated 5 out of 5 by Jack R from A needed item Item is indispensable for moving back the delta spring on your AR to work on the handguard. Otherwise you need three hands! Rated 4 out of 5 by TRE 13 from The price was fair. A handy tool, making the upgrade on my rifle easier. Rated 5 out of 5 by Earl from good value , good quality Works great on all uppers even with scopes on . Most of my AR's have free float tubes or quad rails . But there are a few I have kept the old hand guards on them. This tool is a must have for easy handguard removal to inspect of the gas tube and barrel . Remember a cracked or blown gas tube will leave you with a single shot gun and a face full of soot . One tool to rule them all. A foundation to build, maintain, clean and reconfigure.